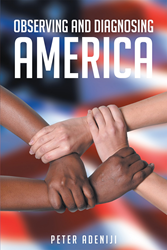 Recent release “Observing and Diagnosing America” from Page Publishing author Peter Adeniji is both telling and enlightening; this work aims to provide reason to eliminate racism, hatred and inequality to better our nation. Peter Adeniji, a board certified practitioner of holistic and integrative medicine of the American Council of Holistic Medicine, researcher, devoted writer and published author, has completed his new book “Observing and Diagnosing America”: a gripping and potent work that examines modern society and the negative effects of bigotry towards immigrants. Published by New York City-based Page Publishing, Peter Adeniji’s eye-opening work scrutinizes the current cultural aspect on immigrants, race and equality. Observing and Diagnosing America is an attempt to focus the attention of Americans to the problem they pose for themselves and other immigrants in their midst, it highlights the alienation usually felt by naturalized citizens of the United States and the cycle of vicious behaviors toward an innocent population. The book shows that the racist attitudes that were the bases of the founding of the American nation must be discarded, making all immigrants welcome both naturally and psychologically and eliminating discord between races in the country. Unless immigrants come to grip with the situation at hand and start treating one another with respect, the fabrics holding the nation together may break apart at the seams. Readers who wish to experience this potent work can purchase “Observing and Diagnosing America” at bookstores everywhere, or online at the Apple iTunes store, Amazon, Google Play or Barnes and Noble.